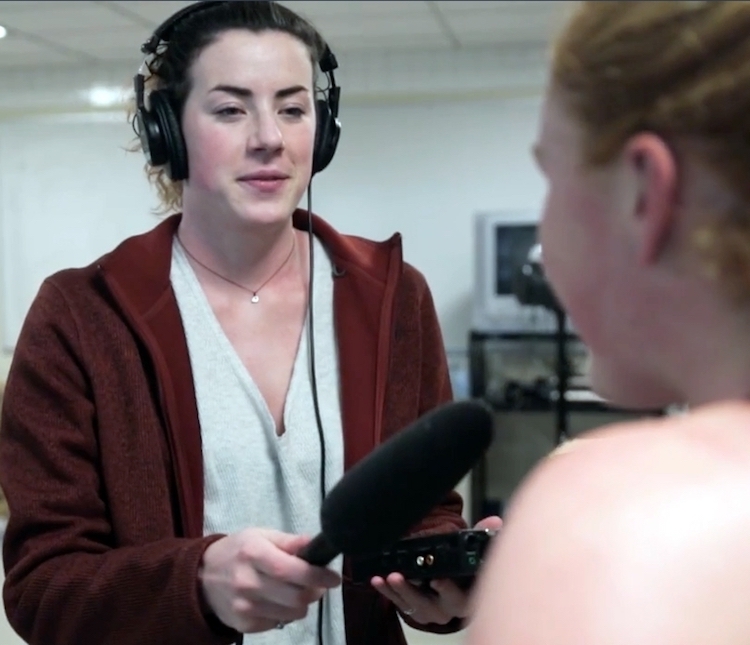 A student podcaster at Middlebury. From Page to Podcast was a really exciting inter-disciplinary and inter-departmental collaboration this winter term. P2P involved 30 student participants split between two independent, yet interdependent, courses: From Page to Podcast: Writing Audio Fiction (English) and From Page to Podcast: Producing Audio Fiction (FMMC). 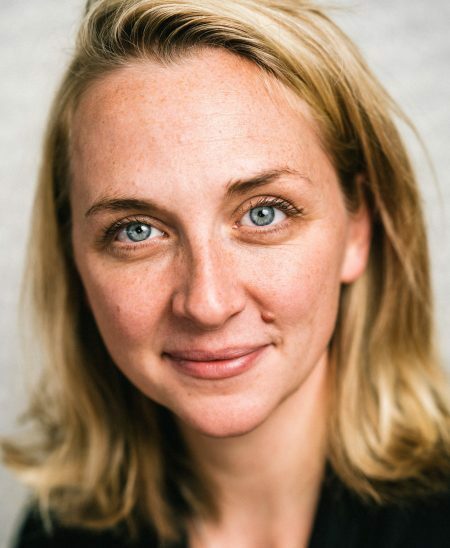 In P2P: Writing Audio Fiction, students spent two weeks in an intensive writing workshop crafting original flash fiction stories (less than 1,500 words) under the tutelage of visiting faculty member Amanda Krupman, a New York-based writer. A number of students were longtime writers themselves, while others were completely new to the craft. Halfway through J-term the writers (bravely!) were matched with a student producer from my P2P: Producing Audio Fiction course, in which a group of students had spent the previous two weeks listening extensively to a variety of sound-rich podcasts and immersing themselves in the production process through creative exercises and critique. The producers were charged with adapting these original stories for audio and close collaboration between writer and producer was strongly encouraged. Listen to Pens, written by student Jasmine Chau and adapted for audio by Olivia Ryder, created in Amanda Krupman’s Writing Audio Fiction and Erin Davis’s Producing Audio Fiction Winter Term 2018 courses. Note: There is some adult language (cursing) in this podcast. Note: There is some adult language (cursing) in this podcast. Listen to Check Please, written by Annie Grayer and adapted for audio by Sydney Warren, created in Amanda Krupman’s Writing Audio Fiction and Erin Davis’s Producing Audio Fiction Winter Term 2018 courses. Note: There is some adult language (cursing) in this podcast. Listen to student Hannah Yindra’s take on Where the Wild Things Are by Maurice Sendak, created in Erin Davis’s From Page to Podcast: Producing Audio Fiction Winter Term 2018 course. The term was punctuated by three events which we all attended: (1) A guest lecture via Skype from renowned fiction podcaster Jonathan Mitchell, creator of The Truth podcast from Radiotopia; (2) a celebratory introduction of each partner group to initiate the collaborations; (3) the course(s) culminated in a premiere event in the Axinn Abernethy Room at which we gathered to listen to the final version of each production for the first time. Printouts of the original stories were available too. We were joined by friends and faculty as well (including previous production students of mine who remembered the excitement of their own premiere events!). The variety of subject matter, style and sonic interpretation varied greatly and was impressive. All students left both courses with new practical skills, whether related to writing or production, as well as a concrete work sample to use in their future endeavors, whether creative or professional. Several producers submitted their work to The Sarah Awards, a premiere audio fiction contest hosted by Sarah Lawrence College. And one student will be going on to intern with Jonathan Mitchell in New York City this summer! One thing that Amanda and I observed in our evaluations was the sense of freedom the students of both classes seemed to enjoy—to be creative, weird, and imaginative; to use the intellectual acuity they are cultivating at Middlebury for something that’s really, well, FUN. We enjoyed providing that opportunity as it combined with practical outcomes of skills acquisition. We are grateful to the curriculum committee and to the departments for supporting this experiment. One last thing: Amanda and I engaged in our own collaboration during winter term as well. Together, we produced her published short story “Jitters,” which is the story of a woman whose wedding jitters are manifesting as an overwhelming paranoia of bed bugs. We completed the story and are pitching it widely to fiction journals, contests, and podcasts. With hope, it will find a home in the coming weeks and months. Erin Davis is an artist, filmmaker, radio producer and educator living in Vermont, USA. Erin teaches courses in radio documentary and audio podcasting at Middlebury College. Her favorite game is catch.